Have you ever opened the door to your electrical panel and noticed that some of the circuit breakers (a.k.a. overcurrent protection devices) have buttons on them with the word “Test”? If so, you are probably looking at either a GFCI or AFCI device. Let’s review how both types of electrical components are designed to protect you and your home. through the black and white wires and is designed to shut off the electricity in a fraction of a second if it detects an imbalance or current leak. This could happen if you touched a wire and electrical current started to pass through your body as it was seeking a pathway to ground. Instead of allowing you to get electrocuted, the GFCI safety device would normally trip and shut off the power. basements. All of these locations have the potential for moist conditions and should have GFCI protection on the electrical outlets either at the receptacle or at the panel. Since around 2002 another type of electrical safety device has been showing up more frequently in homes. It’s called an AFCI, or Arc Fault Circuit Interrupter. This device offers protection to people by monitoring the electrical circuit for arcing or sparking that could lead to a fire. When the AFCI first appeared, it was required only in bedroom circuits. 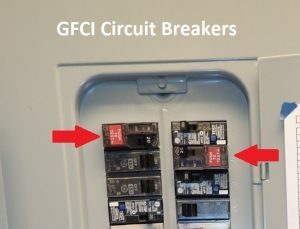 If you open an electrical panel in a newly built home you’ll see this type of circuit breaker on practically every circuit. 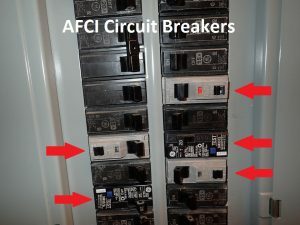 The newest type of AFCI breaker is called a Combination AFCI and can detect both parallel arcs and series arcs. In layman’s terms, they offer protection against more electrical situations that could start a fire. All this extra protection comes at a cost. Both GFCI and AFCI devices can cost 2-3 times or more than their traditional electrical counterparts. This goes for both receptacles and circuit breakers. Early generation GFCI’s require regular testing to make sure corrosion has not rendered the device inoperable. Some early generation AFCI’s have had problems with nuisance tripping, especially when used on improperly wired circuits or on ones that supply power to treadmills, power strips, fluorescent lights and certain televisions. Both GFCI and AFCI devices are sensitive to wiring problems and will likely not function properly if miswired. Always consult a licensed and qualified electrician when installing or trouble-shooting GFCI and AFCI devices and their protected circuits.